HomeDiscover how MacBag Geomattresses worked into a bank protection project. Discover how MacBag Geomattresses worked into a bank protection project. 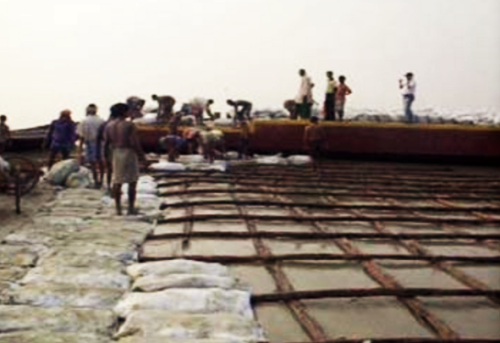 Maccaferri bank security measures, including MacBag Geomattresses, are used for the Hoogly river bank protection project in West Bengal. The Hoogley river in Nishchintpur flows through the western part of the Sundarban Delta in West Bengal. Studies at Jadavpur University have proven a new tide gauge record; the sea is rising at a rate of 3.14 mm annually. Due to the rising of sea level and high rise tides, part of the river bank has lost about 80 Sqkm of land during last 20 years. Homes, lands, and peoples lives have been destroyed and washed away by the aggressive tides of the river. Different types and combinations of bank protection measures had to be adopted in light of the critical nature of the situation. Transverse structures needed to be provided to protect the bank from waves and currents. The purpose of the transverse installations is to deflect the water away from the river bank. Spurs are the best option to reduce the degree of impact of water on the bank. The Kolkata Port Trust (KoPT) has suggested constructing Spurs in series to resist the current given the excessive length of the affected bank (5-6 Km). A crucial advantage of this arranged installment is that after time elapses, silt will accumulate in between Spurs, ultimately forming a permanent bank. KoPT has suggested providing polymeric gabions filled with geotextile bag for stretches of 750m to make up for lost land. The construction steps are as follows. First, a multifilament woven geotextile acting as a filter is installed with the help of fascine grid. This grid has to have side lapping of minimum 400 mm and a horizontal lapping of minimum 250mm. Once this has been completed, new Spurs are built, and the nourishment of the existing Spurs with geotextile bags is initiated. This is done to ensure that the Spurs can turn into a permanent bank by way of siltation. The geotextile bag’s used should be made of Polypropylene multifilament weaved fabric. The laterite blocks designed to cover and protect the spurs are made from such geotextile bags. In the case of this project, Maccaferri used its MacBag Geomattresses. For more technical details, please download our Case History.